Meeting for the discussion on Inclusion of Waste-pickers in Solid Waste Management in Dehli, India. March 2018. 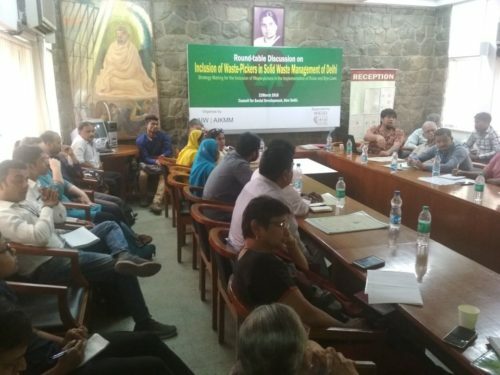 On March 21, 2018 took place a round-table to discuss the inclusion of waste pickers in Solid Waste Management of Delhi organized by​ the Alliance of Indian Wastepickers (AIW), All India Kabadi Majdoor Mahasangh (AIKMM) and WIEGO at the Council for Social Development, New Delhi, India. Focusing on recently released Solid Waste Management Bye-laws of National Capital Territory Delhi, Solid Waste Management (SWM) Rules, 2016 mandated inclusion of waste-pickers in solid waste management in all cities and villages of India. The rules provided broader guidelines including registration of waste-pickers and informal waste collectors, their inclusion in solid waste management plans, capacity building through training and their presence in state advisory committee on solid waste management. States were asked to create state-level solid waste management strategies and plans. One way to do so is by creating bye-laws for the respective state. There has been a case going on in Delhi High Court regarding waste management in Delhi. In one of the hearings of the case, the court asked the office of Lieutenant Governor to frame bye-laws on waste management for all municipal authorities in Delhi. The bye-laws were recently notified. Bye-laws go in depth about penalties for littering of waste or waste mismanagement by the residents of Delhi. In case of waste-pickers and informal waste collectors, the bye-laws merely repeat few passages from SWM rules. Bye-laws were meant to detail out the standard operating procedure. They do so, but not in the case of inclusion of waste-pickers. 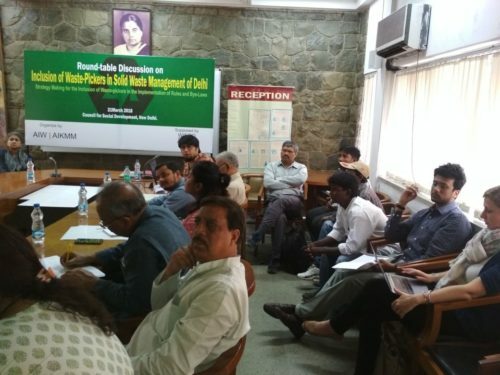 In this context, Alliance members in Delhi have called for a meeting to strategise a plan for inclusion of waste-pickers in the solid waste management of all four corporations of the city. All members (their representatives) of Alliance in Delhi will have five minutes to share about their work and reflection on the norms: All India Kabadi Mazdoor Mahasangh (AIKMM), Bal Vikas Dhara, Chintan, Kachra Kamagar Union,Lok Adhikar and Safai Sena. The meeting is to be convened by Jyoti Mhapsekar, President of Stree Mukti Sangathana and Convenor of Alliance. The Solid Waste Management Rules came into force in 2016 (SWM, 2016, hereafter), revised after a period of 16 years since the Municipal Solid Waste (Management and Handling Rules) 2000. The rules provided broader guidelines including registration of waste-pickers and informal waste collectors, their inclusion in solid waste management plans, capacity building through training and their presence in state advisory committee on solid waste management. States were asked to create state-level solid waste management strategies and plans. Enactment of these laws have garnered both positive and negative views from people in various fields. One huge bone of contention has been the role and inclusivity of informal waste pickers in the solid waste management system. Falling into one of the lowest rungs in the informal formal forms of employment, the waste workers have often been neglected and invisibilized not just by the society, but also by the State. Ironically, those who pick waste are greatly discriminated against and the work itself is extremely hazardous, exposing waste pickers to pathogens, toxins, injuries etc. No basic amenities are provided by the State Government or the Urban Local Bodies. They have no access to even minimal health facilities, drinking water provision, sanitation, and educational facilities. The informal waste pickers provide valuable service for government and society. In this manner, not only do they keep the city clean, but also save a huge amount of money which would otherwise have to be spent by the Municipality for the removal of waste from throughout the city. Regional authorities and the Urban Local Bodies (ULBs) were given the liberty of making bye-laws for their respective territories and areas of governance under the SWM, 2016. The Bye-laws in Delhi were framed by the South Delhi Municipal Corporation and passed in January 2018 under Section 5 of the Environment (Protection) Act, 1986 . Bye-laws go in depth about penalties for littering of waste or waste mismanagement by the residents of Delhi. In case of waste-pickers and informal waste collectors, the bye-laws merely repeat few passages from SWM rules. Bye-laws were meant to detail out the standard operating procedure. They do so, but not in the case of inclusion of waste-pickers. This round-table discussion was held to examine the clauses of the bye-laws and was facilitated by Kabir Arora of AIW and convened by Jyoti Mhapsekar​, President of Stree Mukti Sanghatana and Convenor of Alliance. The discussion began with Kabir explaining the larger framework of the Solid Waste Management in India, setting the context and introducing to the audience few important definitions and concepts related to it. Kabir explained the concept of Swachh Survekshan (annual survey conducted under the flagship programme of Swachh Bharat Abhiyan). in their groupslist of ward allocations by waste pickers (Swachh Survekshan Survey Toolkit 2018: MoHUA). According to these clauses, the region is marked, with 32 being the highest grade for a 100% integration and 1-19 being the lowest grade scale for a 2% integration. The Waste Management rules passed have talked about only inclusion of waste pickers into the formal system without mentioning its process and framework. This leaves the issue at an extremely ambiguous position. While the Bye-laws were expected to cover these issues, they have been excluded from it too. This point was also reiterated later by Pravin Kushwaha of Gurgaon Water Forum/JNU who argued for the need of a detailed breakdown of different aspects related to waste work. A detailed plan and budget should be laid down for covering door to door collection, transportation, Material Recovery Facilities etc. and making it clear the exact roles of different stakeholders in the process. The gathering rejected the Bye-laws and deemed it extremely insufficient especially in regards of incorporating waste pickers. No citizenship representatives were part of this committee that formulated the bye-laws ignoring the views of the larger community. Also, not any waste pickers’ views were incorporated and as a result this document does not speak for the workers. No details are given on the process of their inclusion and role. The discussants felt that the Bye-laws are just a replication of words, definitions and clauses from the Solid Waste Management Rules, 2016 and does not adhere to any specific needs of the city, its waste management system and its workers. NCT being a role model for many other regions rather provided a bad model of waste management system through the bye-laws which is extremely unfortunate. A decentralized process with clear cut roles for waste pickers need to be formulated. Sandhya Narayanan​, core team member to prepare micro-plans in Bengaluru presented the model that has been implemented there. She began by critiquing the SDMC model as poorly drafted and needs to be rejected outright because of its inefficiency and lack of perspective especially that of waste picker inclusion. Issues of waste pickers should not be examined in isolation from the broader picture of Solid Waste management as this would not be a holistic approach. The issues of waste pickers should be looked through the SWM framework and their fight for right to access not just waste but clean, dry and segregated waste should be located within it. Transportation cost of waste she insists should be borne by the municipalities. A tripartite agreement among the municipality, a waste organization and waste pickers should be formed. Disposal of sanitary napkins and diapers is an issue as manual handling of it is a violation of the Manual Scavenging Act, 2013. For products like this, there should be Extended Producer Responsibility where the manufacturers of the product provide with proper packaging or other methods of its disposal. While getting recognized as workers and getting ID cards for it is an important step, Sandhya argued that it was not sufficient in the fight for work and livelihood. She pointed out that in near future if we follow a Singapore-like model, there is going to be hardly any stray waste on the streets. Thus, the most essential fight is in absolute right over dry recyclable waste. What was the point of being identified as a waste picker with the help of an ID card if there was no access to waste? An issue regarding disposal of waste was its disposal in black dustbin liners. People tend to mix all kinds of dry, wet and sanitary waste and dispose it all together. To begin with, it is extremely dehumanizing for the waste pickers who have to then separate out the waste with their hands. Also, mixing dry and wet waste reduces the value of high caloric value waste. If the waste becomes too difficult to segregate, it goes on to be dumped in the landfills. A possibility of retaining recyclable and reusable waste is lost. She also cited the example of Pune waste pickers who are strongly organized under SWaCH. Unsegregated waste is dumped in front of households as acts of resistance to encourage people to separate their waste at generation point. During the discussion round, Prakash Kumar of Kachra Kamgar Union argued that the civil society should fight for providing an alternative and secure source of income for these waste pickers instead of just fighting for their identity as waste pickers. He also went on to ask how the prices of waste recovered can be made safe from drastic fall in prices and market fluctuations. Dr RS Tiwari​, labour expert and trade union activist raised a few questions. He questioned if the SWM Rules and bye-laws covered medical waste and its segregation and if e-waste as well as nuclear waste are being covered in the bye-laws. Further, the issue of statistics on number of waste pickers was raised, and if Bangladeshi workers were given ID cards and recognized as waste pickers. Mahesh Upadhyay of Solidarity Center brought forward the problem of how with good intentions and in an attempt to save the waste pickers from market fluctuations, many NGOs have started contracting out waste pickers into large establishments like hotels and have fallen prey to the value chain system and have taken away from the waste pickers, the right to access to waste. Shashi Bhushan from AIKMM suggested that the bye-laws should be rejected and if necessary, the case should be moved to court. Exact process of registration to be followed in NCT needs to be spelt out which is absent in the bye-laws. One concern here could be the linking of national ID card with the work ID card. Waste pickers should be given the full rights to access clean dry segregated waste. For that, awareness has to be created for segregation of waste at generation point. The waste pickers should also have rights to buy and sell waste to the Material Recovery Facilities. Training should be given to all waste pickers for better understanding of sustainable practices towards waste management as well as to have basic understanding of the rules. For these, and other related measures, there needs to be knowledge about the exact numbers of waste pickers as this is extremely important to carry out further actions. Many suggestions and other discussions were carried out. The final verdict was that of rejecting the bye-laws as insufficient and lacking perspective. The participants agreed to make a press release stating its rejection. A position paper will be written and circulated. The round-table members have agreed to sit and draft an alternate bye-laws keeping in mind the perspective of the waste pickers as well as involving citizen representatives which was missing in the present bye-laws. The Ministry of Labour and Employment should be involved as this involves securing labour rights of these informal workers. Another initiative was suggested that the organizations working in the interest of the waste pickers should provide the waste pickers a platform to give their testimonies so as to create awareness of their issues and needs. The members agreed on the need to meet more often as a forum and work together to secure the rights of the waste pickers. A decision was taken that the organizations working in the interest of the waste pickers in Delhi will be meeting on a monthly basis and discussing the necessary issues. Participants​ : Representatives of AIW, AIKMM, Bal Vikas Dhara, Chintan, Kachra Kamagar Union, Lokadhikar, Safai Sena, WIEGO, individuals and members of other organizations and academic institutions. Full list could be accessed in the PDF.